Note: the New Shares (De000WNDL011) will merge with the Old Shares (DE000WNDL193) after approval of the admission prospectus. Following the purchase of 100% of the shares in the Bebitus Retail S.L., subsequently renamed into Bebitus Retail S.L.U. having its registered seat in Barcelona, Spain, the Company has agreed to conditional, subsequent purchase price payments to the sellers of the shares, Mr. Guillermo Sanz Marzà and Mrs. Alexandra Viguera Andreu (the “Founders”) by way of a settlement agreement, which can be fulfilled either through the issuance of shares or payment in cash. The Company has decided to issue shares to for the partly fulfilment of the claims for subsequent purchase price payments and has applied for the admission to trading of the shares issues with the Frankfurt Stock Exchange pursuant to Section 4 para. 2 No. 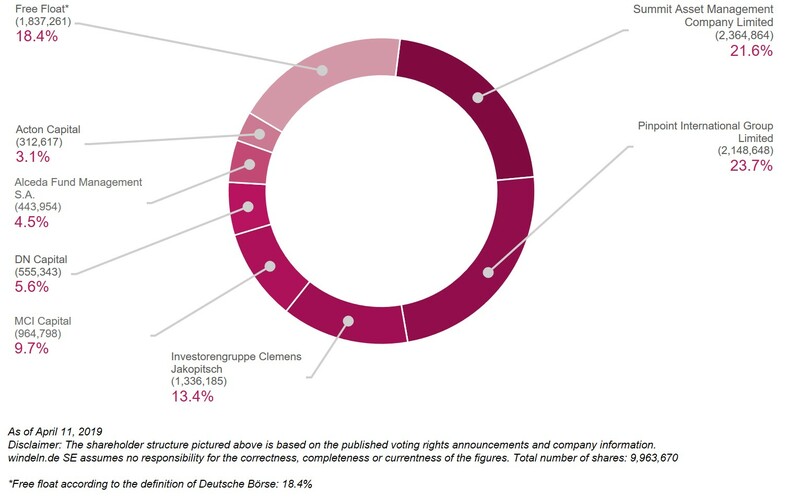 6 of the Securities Propectus Law (Wertpapierprospektgesetz, WpPG), which contains information about the number and the type of the securities and which explains the reasons and details of the offer. This document can be inspected at the Company. The Extraordinary General Meeting 2019 of windeln.de SE took place on 09 January 2019 at 11 am at the Münchner Künstlerhaus-Stiftung, Lenbachplatz 8, in Munich. At the time of convening the extraordinary General Meeting, the registered capital (Grundkapital) of the Company amounted to EUR 31,136,470.00 and was divided into 31,136,470 bearer shares with no par value. Each share grants one vote. The total number of shares and voting rights at the time of the General Meeting’s convocation thus amounted to 31,136,470 respectively at the time of convening the extraordinary General Meeting. The Annual General Meeting 2018 of windeln.de SE took place on 25 June 2018 at 11 am at the Münchner Künstlerhaus-Stiftung, Lenbachplatz 8, in Munich. The following English documents are translations of the German originals; in case of doubt, the German originals shall supersede the English translations. At the time of convening the General Meeting, the registered capital (Grundkapital) of the Company amounted to EUR 31,100,743.00 and was divided into 31,100,743 bearer shares with no par value. Each share grants one vote. The total number of shares and voting rights at the time of the general meeting’s convocation thus amounted to 31,100,743 respectively at the time of convening the Annual General Meeting.